“Doctor, will I have a scar?” This question comes up in many, if not most, discussions related to an injury or surgery. Underlying the question is concern regarding appearances and possible disfigurement following one or the other. Although most people would rather go through life without physical scars, life is a contact sport and some scars are inevitable along the way. What is interesting is the ambivalent attitude we demonstrate regarding certain scars. For example, for many women the scar of a mastectomy (removal of the breast for cancer) is terribly disfiguring and an unwelcome reminder of a life threatening intrusion in their lives. For some, however, it is a badge of courage signifying cancer survival, to be worn proudly. 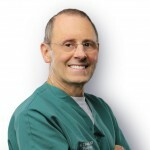 Our bodies, for all their incredible complexity and capabilities, have a single relatively simple manner of healing from surgery and/or an injury: we form a scar. Scars are nothing more than a bundle of fibrous tissue laid down by cells, called fibroblasts, to patch a gap or rent in any tissue whether an organ, skin, muscle, tendon, ligament, blood vessel, fat, or any combination thereof. When an injury occurs whether by accident or a surgeon’s knife the break in the continuity of the tissue(s), in ways we don’t fully understand, this initiates a cascade of events that stop bleeding, clean up dead tissues, fight off germs, and, finally, produce a scar. In addition, somehow our bodies recognize when the area is sufficiently healed and know when to turn off the process of scar formation. Sometimes this “off” switch malfunctions and we see this with hypertrophic (thickened) scars and keloid scars (see box). All surgical specialties deal with scars but plastic surgery is the specialty which is most attuned to the issue. Plastic surgeons are supposed to be the experts in producing the best, most inconspicuous scars and we have many tricks to accomplish this. Careful placement of incisions; attention to meticulous and gentle handling of tissues during surgery; and proper aftercare all contribute to producing the best possible scar. Unfortunately, we are not magicians and, when an incision is made, there will be a scar. Despite all the advances of modern medicine, we do not yet have the ability to precisely control the quality of a scar in any situation nor can we reliably predict which patients will have problems with their scars. Most people have a misconception of what keloid scars are. Patients often describe their scars as “keloid” when what they really have is a normal scar that they feel is unsightly. Fortunately, true keloid scars are uncommon. They can occur in anyone but are most common in patients with a darker complexion such as African-Americans and those of middle-Eastern descent. They are more common after burns and in scars on certain areas of the body, such as over the breast bone. A keloid scar is due to a defect in the mechanism that shuts off scar formation after healing is complete. The area continues to produce scar tissue, which eventually overgrows and spreads out from the area of the original injury. The cause of keloids is a mystery. A person may have several injuries or incisions and one becomes keloid while the others do not. They may form keloids at a certain age but never again after that. Keloids are true tumors of scar tissue. In addition to being disfiguring, they can itch, burn, and/or hurt. A variety of treatments have been tried with mixed success: pressure therapy, silicone patches, and steroid injections. The most effective treatment is surgical removal followed by a course of radiation to the area. 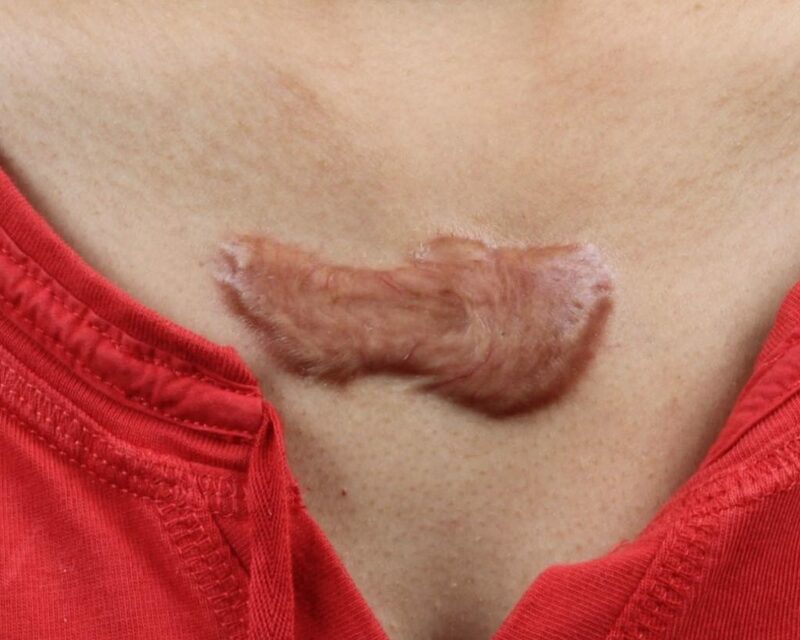 Thickened scars, called hypertrophic scars, can mimic an early keloid but do not progress to the exuberant degree that keloids do and usually resolve with time. I have seen just about everything under the sun put on scars to improve them: lanolin, udder butter, vitamin E, emu oil, Vaseline, and a variety of salves, unguents, and emollients limited only by human imagination. What they all have in common is that none has been proven to be really effective in improving scars. Perhaps the best known commercial product is Mederma, a product made from onions. Mederma is a perfect example of the triumph of marketing over substance in that there are no studies that support its effectiveness. One substance that has been shown to help improve scars is silicone. This comes as a gel or a patch. We don’t know exactly how it works, but work it does. A simple, low tech way to improve scars is massage. The effect of massaging a scar regularly is to speed up breakdown of the early, immature scar tissue and replace it with a softer, flatter more mature type of scar tissue. Applying constant pressure to a scar with some sort of elastic garment will speed up softening and flattening of scars. Compression garments are routinely used in burn centers to improve the severe scars from those injuries. Lasers are often regarded by the general public as having almost magical capabilities. They are great for some things, however, as a method of improving scars, they have been largely disappointing. The best time to start scar therapy is as early as possible. Once a scar is mature, usually nothing less than revision surgery is likely to improve it. Our ability to heal with minimal scarring varies with age. The best scars are seen in the youngest patients. Surgery done in the first months of life of leave incredibly fine, almost invisible scars. Such scars are seen in children who have cleft lips repaired in the first few months. Those scars are usually superb. Even more, when surgery is done in infants in the womb, the scars from those operations are almost non-existent. The adolescent years are among the worst for scar formation. Something about all the hormonal changes that accompany puberty affects the healing process. While teenagers heal quickly, they don’t always make the best scars. One intriguing fact about scars is that as we age, our scars mature more rapidly and often turn out less conspicuous than when we are younger. While a teenager or twenty-something may take a year or longer to fully mature a scar, someone in their 50’s or 60’s may do this in six months or less. To produce a scar, an injury has to go deeper than the epidermis, the superficial layer of the skin. All scars are permanent. Once you have a scar, it may be possible to improve it, but never to eliminate it completely. Scrapes and cuts heal faster, and with a better scar, if kept in a moist environment, e.g. antibiotic ointment and a dressing, than if allowed to form a dry scab. The healing process does not distinguish between different tissues. Skin, fat, muscle, tendons, and ligaments will all be glued together with scar unless measures are taken to prevent this.